So you have a planned a weekend away, great! You definitely deserve it. As exciting as it is to pack up everything and leave for your getaway, take some time to ensure that you have everything you need for when you return home too. The last thing you want is to come home and find your fridge empty and your home showing signs of a last minute pre-holiday rush! Follow these simple tips so you can enjoy your weekend away. Make sure you have staples in your pantry – we’re talking butter, milk, and other vital ingredients that allow you to make a quick and easy meal for your hungry tum when get home. Even better, if you have the time, prepare a lasagne or another simple easy freeze dish that can you can quickly reheat when you return home. Sometimes the last thing you want to do is cook meal after a weekend away. Remember to make your bed before you leave with fresh sheets. 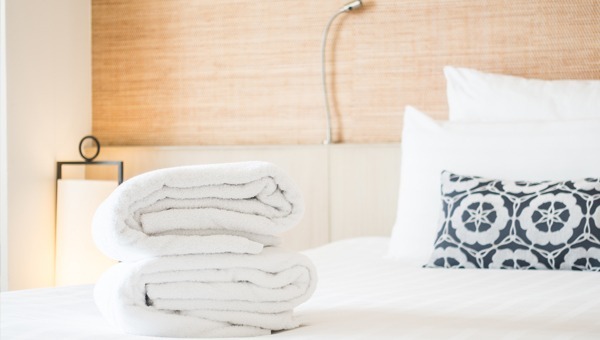 Put out fresh towels as well, so your home is just as nice to come to, as your holiday was. Unpack your bags or suitcase as soon as possible – it saves you from living out of your suitcase, creating a ‘floordrobe’ and having no idea of what is clean and what is not. Remember to sort out your washing and try and get a few loads on. This leaves you with clean clothes to wear, and less clutter upon your return. Restock and repack your toiletries, so you are prepared for your next getaway. Enjoy your weekend holiday to the fullest by following these simple organisational tips that leave you prepared, and hopefully keep that holiday feeling a little bit longer!